Theorem 1: If a ray stands on a line , then the sum of the adjacent angles formed is $180 $deg. Theorem 2: If two lines intersect , then the vertically opposite angles are equal. Theorem 3: If a transversal cuts two parallel lines, then each pair of alternate angles are equal, and the interior angles on the same side of the transversal are supplementary. Theorem 4: Lines which are parallel to the same line are parallel to each other. 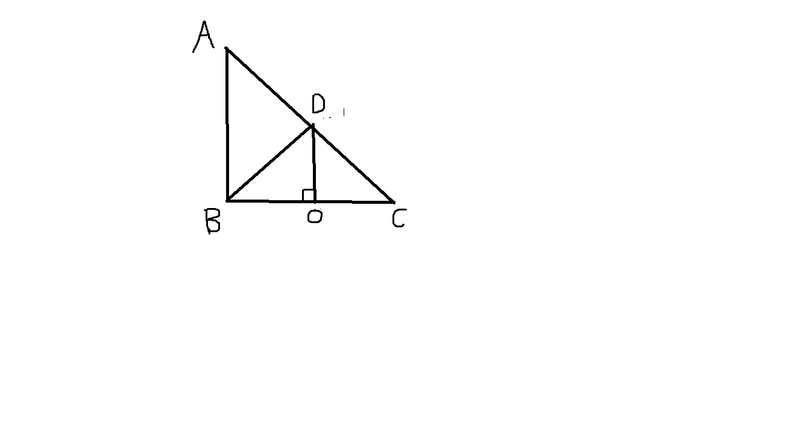 Theorem 5: The sum of the three angles of a triangle is $180$deg. Theorem 6: If one side of a triangle is produced , the exterior angle so formed is equal to the sum of the interior opposite angles. Theorem 7: The angles opposite to equal sides of a triangle are equal in an isosceles triangle. Theorem 8: The bisector of the vertical angle of an isosceles triangle bisects the base and is perpendicular to the base. Let $\triangle ABC$ be a right angled triangle, right angled at $B$. Therefore the hypotenuse is $AC$. Let the middle point of $AC$ be $D$. Now draw a perpendicular $DE$ on $BA$ and $DF$ on $CB$. Now note that $DE \| CB$ (converse of Theorem 3) and similarly $DF \| AB \implies DF \|EB$ (corollary from Theorem 2). Now in $\triangle ADE$ and $\triangle DFC$ we have $1. DA=CD$, $2. \angle AED = \angle DFC$ and $3. \angle EDA = \angle FED$ (from Theorem 3). There the two triangles are congruent. Hence we get $AE=DF$. But since in quadrilateral $DEBF$ we get $DF \| EB$ and $DE\|FA$ hence quadrilateral $DEBF$ is a parallelogram and so $DF=EB$ and $DE=FA$ thus giving us $AE=EB$ making $E$ the midpoint of $BA$. Now we note that in $\triangle ABD$ we get that$DE$ is the perpendicular bisector of $BA$. Hence $\triangle ABD $ is isosceles (converse of Theorem 8). We then get $AD = DB$. Similarly by proving that $\triangle DBC$ is isosceles we get $DB=CD$. Thus the theorem is proved. Let $ABC$ be the triangle, with $C$ the right angle. Draw parallel lines to $AC$ and $BC$, through $B$ and $A$ respectively. Say they intersect in $D$. By Theorem 3, $\angle ABD$ and $\angle BAC$ are equal. So are $\angle BAD$ and $\angle ABC$. Therefore $\triangle ABC$ and $\triangle ABD$ are equal, by $ASA$. We get that $ABCD$ is a rectangle quadrilateral. Say that $CD$ intersects $AB$ at $M$. By $SAS$ we have that $\triangle DBC$ is equal to $\triangle DAC$. Use now Theorem 3 again , and the equality of all those right-angle triangles to show that $\angle DBA$ and $\angle BDC$ are equal. This shows that $\triangle DMB$ is isosceles. Similarly it follows that $\triangle BMC$, $\triangle CMA$, and $\triangle AMD$ are all isosceles. By $SAS$ $\triangle BMC$ and $\triangle DMA$ are equal. The $M$ is the mid point of $AB$ and $CM=BM$. I didn't read Theorems 1–8, but offer the following proof: The midpoint $M$ of the hypotenuse $AB$ is the center of a Thales circle with diameter $AB$, and $MC$ is a radius of this circle. How to prove that two lines of a shape are parallel?